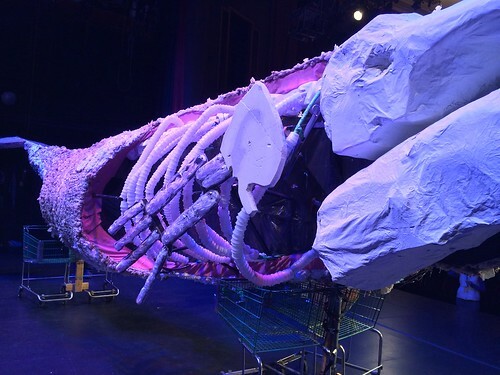 Yesterday, a giant whale made its way onto UM’s campus – but this whale was made of plastic. 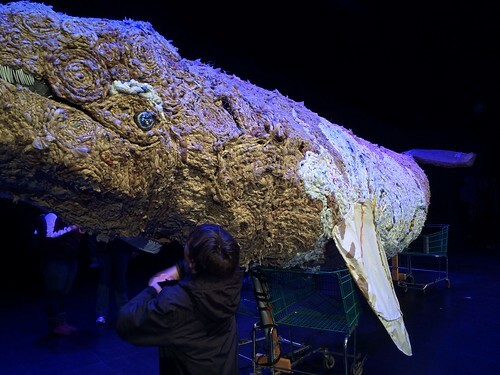 “The Plastic Whale Project” is a 350 pound 35-feet-long whale made of plastic bags and other plastic debris that most often makes its way into the Pacific Ocean. The Montana Kaimin, UM’s school newspaper, interviewed Barbara Koostra, director of the Montana Museum of Art and Culture. 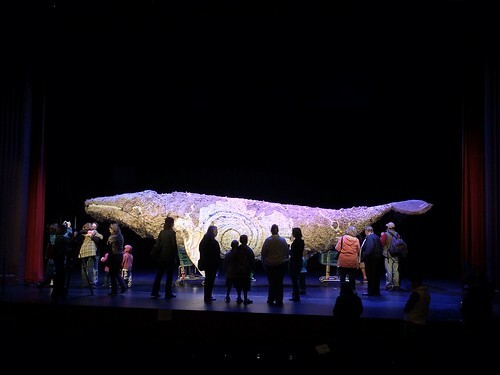 Koostra said that a whale that washed up on a beach in West Seattle in 2010 was the muse for this piece, as the whale had digested a plethora of plastic bags and other plastic debris. The artist behind the whale project is Carrie Ziegler, and you can see more of her artwork on her website. 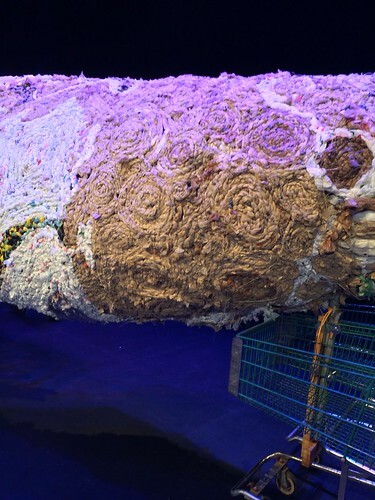 This whale is meant to be a commentary on plastic bags other recyclable trash that isn’t recycled and instead makes its way into the ocean, which negatively affects the marine environment through animals ingesting the plastic or through habitat degradation. Upon closer look, you can see that the brown plastic bags are a representation (and a map) of the United States. 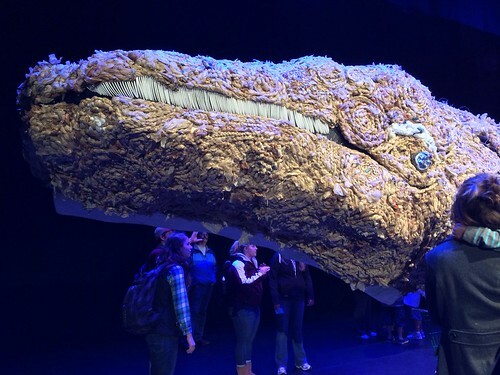 The presenter at the Dennison Theater said that the map is supposed to show how much of the United State’s coast line touches the Pacific Ocean and how plastic bags from the whole United States can make their way into the Pacific. It may be difficult to see, but the brown mass is the United States – the left side is the Pacific Ocean. I am no stranger to these plastic issues, having written blog posts about plastic bags and plastic bottles numerous times before. Recycling is the easiest and most effective way to combat plastic pollution in oceans, which I have mentioned plenty of times before. Plastic bags are continually banned in some states and cities, especially in California, but until the bag ban hits your city, please take your clean plastic bags to a super market to recycle them, or use reusable bags. As always, try to cut down on plastic use, and reuse things like plastic forks and plastic spoons to prevent them from being littered. Also, companies like Method Soap have collected plastic from the Pacific Ocean and created bottles out of them for their soap products. Pretty cool, huh? Remember, almost everything is recyclable in 2013, so take advantage of that! Visit the project’s website here and check out the artist’s website, too!